A line of tablet computers designed, developed and marketed by Apple Computer Inc., primarily as a platform for audio-visual media including books, movies, music, games, apps and web content. Its size and weight fall between those of contemporary smart phones and laptop computers. The iPad runs on iOS, the same operating system used on Apple's iPod Touch and iPhone, and can run its own applications as well as iPhone applications. Without modification, the iPad will only run programs approved by Apple and distributed via the Apple App Store (with the exception of programs that run inside the iPad's web browser). Like iPhone and iPod Touch, the iPad is controlled by a multitouch display—a departure from most previous tablet computers, which used a pressure-triggered stylus—as well as a virtual on-screen keyboard in lieu of a physical keyboard. iPad is sold in Wi-Fi and cellular models. The Wi-Fi connection is used to access local area networks and the Internet. Cellular models have a 3G wireless network interface which can connect to HSPA or EV-DO data networks to access the Internet. Since the release of iOS 5, the device does not need to be managed and synced by iTunes running on a personal computer via USB cable. Historical perspective: Apple released the first iPad in April 2010, and sold 3 million in 80 days. During 2010, Apple sold 14.8 million iPads worldwide, representing 75% of tablet PC sales at the end of 2010. By the release of the iPad 2 in March 2011, more than 15 million iPads had been sold—selling more than all other tablet PCs combined since the iPad's release. 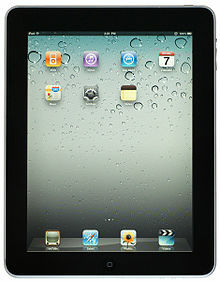 During the fourth quarter of 2011, Apple sold 15.4 million iPads. That's more than any PC maker's TOTAL PC sales during the same quarter. Apple sold 300,000 iPads on the day they first became available. Apple sold more than 15 million iPads over the course of its first nine months, generating $9.5 billion in revenue and capturing more than 90% market share in the tablet computer segment. Other interesting stats: the iPad, iPhone, and iPod made up 76% of Apple's revenue during the fourth quarter of 2011, and Apple sold more than 172 million of these devices in total in 2011. By way of comparison, all PC makers combined shipped about 350 million PCs in 2011.